Jim Oweyesigire is the new commander of the African Union Mission in Somalia. File photo. 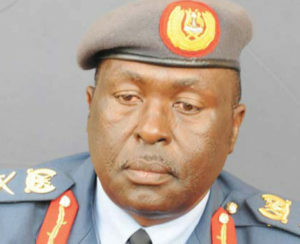 KAMPALA–Maj Gen Gavas Mugyenyi has today (Tuesday) assumed the office of deputy Commander Air Force (D/CAF). Mugyenyi takes over from Maj. Gen. Sam Kavuma who has been appointed deputy Commander Land Forces, according to a highly placed source in the Uganda People’s Defence Forces (UPDF). Speaking at the handover ceremony held at UPDAF Head quarters Entebbe, Maj Gen. Kavuma commended the UPDF leadership for giving him the privilege of serving within Air force, an opportunity he said has enabled him enhance his knowledge, especially in the field of Air Force. “I can now move to international conferences and confidently discuss and deliberate Air Force issues,” Maj Gen Kavuma said. Meanwhile, Maj. Gen. Mugyenyi, the incoming D/CAF, commended UPDAF leadership for the appointment and requested UPDAF leadership to extend the support and cooperation that was accorded to Maj Gen Kavuma. He said the appointment is a tour of duty he is ready to perform professionally. He appealed to UPDAF to maintain the already existing spirit of cooperation as they work harder towards maintaining UPDAF mission and mandate. The ceremony was presided over by the Commander Air Force (CAF), Maj Gen. Charles Lutaaya and witnessed by, among others, UPDAF Chief of Staff(COS) Brig Burundi, Uganda Air Force Academy Commander Brig Kazahura, Under Secretary Air Force Mutabazi, UPDAF Air Base Commanders and Directors. Maj. Gen. Sam Kavuma has been appointed deputy Commander Land Forces. File photo. Maj Gen. Lutaaya congratulated Maj Gen Kavuma upon his new appointment, saying that his professional leadership and command style massively contributed to UPDAF progression and performance. In a related development, Lt Gen Jim Owoyesigire, the former Air Force commander has been appointed overall commander of the UN-backed African Union Mission in Somalia. Uganda takes over this mandate from Ethiopia. Lt. Gen. Jim Owoyesigire had in 2012 fallen out of favour with the President when he became a victim of an inquiry into the August 12 military helicopters’ disaster in which seven servicemen died. He was consequently sacked together with his Chief of Staff, Brig. Moses Rwakitarate, following the findings of the Gen. Salim Saleh-led investigation into the multiple crashes on Mount Kenya. The three ill-fated MI-24 attack helicopters that were bound for Mogadishu in August to be used in war against Somali insurgents crashed on Mount Kenya under unclear circumstances.